The alarm went off at 5.30am and I woke up not having a clue at first where I was. I thought for a moment or two I was at home and had to go into London, but then the sleep haze cleared and I was in Kilnsea, East Yorkshire. Brilliant. Peering out of the window it was still blowing a gale and raining, but that was OK. A seawatch beckoned. 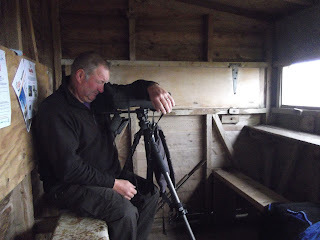 I was at the Seawatch hide by 6.30am and there were already a couple of guys in there, scopes at the ready. One was top Yorkshire patch lister Steve Exley. Steve lives up the road from the Crown and Anchor pub and holds the record for a year's patch listing in Britain with a remarkable 254 birds at Spurn. His Yorkshire list is 388*, with many birds turning up in his garden. Having Common Rosefinches on your feeders, Wrynecks wandering around the garden, Great Grey Shrikes popping in, Dotterel flying over, as well as Montagu's Harrier cruising overhead makes up for a garden list one can only dream of. 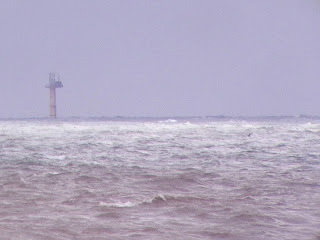 Anyway, he's great company on a seawatch, as is his mate Ian Whitehouse, who actually lives in Dudley, but uses a caravan up the road as a base when the winds look promising. Like Steve he's retired, but sadly he lost his wife – who also loved her birding – three years ago to cancer. Nowadays he admits he has a completely different perspective on life and he spends much of his time of his hobby both at Spurn and abroad – he was planning a trip to Brazil this week. By 7am the hide was pretty much full, and included a post-graduate from York University, Tim, who was one of a group of young lads who were volunteers at the Spurn Observatory. He was perched at the southern end of the hide and pretty much gave everyone the heads-up when birds flew past on the sea from the south. He had experienced eyes for someone so young. Another birder with sharp eyes is former Tice's Meadow patch watcher (he's now based on Portland Bill) Sean Foote, who was also present along with Tice's Meadow watcher Matt Phelps and Steven Penn, so very few birds were missed. 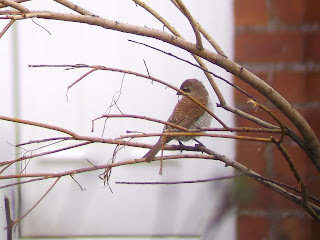 It is important at this juncture to give a word of advice to anyone who reads this blog and who is, similar to me, not an experienced birder but wishes to go on a seawatch. Seawatching is hard-core birding – exhilarating but hard work and it's difficult to make accurate ids. 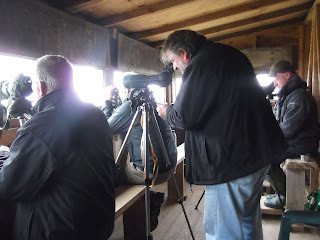 It is imperative to spend the seawatch among experienced birders, otherwise you will see very little, and any birds you do see you'll have little or no clue what they are. Spend a day with people who know what they are doing, however, and you will get so much more out of it. I've not been on many seawatches, but this one was brilliant. While the day before was all about Skuas, mainly Arctics, this day, again with a northerly wind but not as strong, was all about Shearwaters – Manx and Sooty Shearwaters. 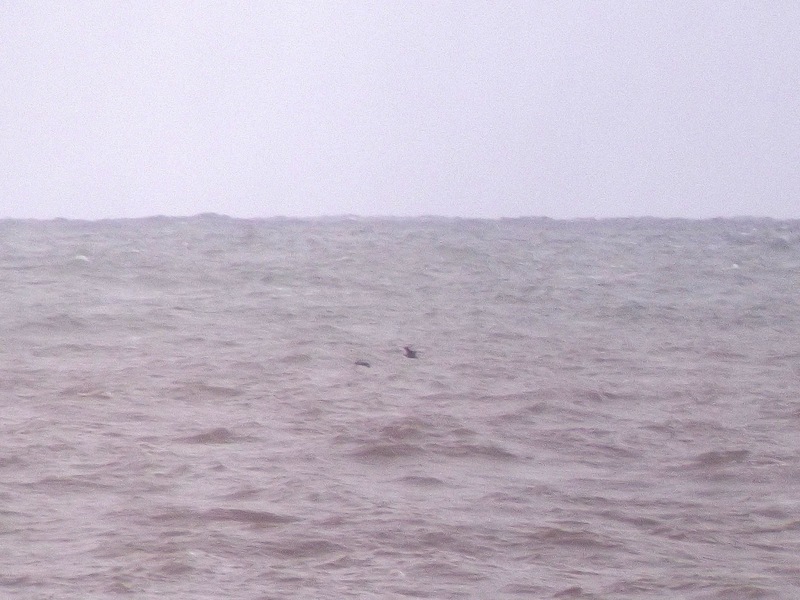 I saw around 25 of the 52 Sooty Shearwater that flew by, mostly heading north, plus many of the 132 Manx Shearwater. It was a morning with plenty of variety. Skuas included 46 Arctic and 13 Bonxies, plus huge numbers of Common Scoter, more than 400, including one large flock of about 250. A highlight was a Velvet Scoter that flew north, plus a Red-necked Grebe (I couldn't get on to another closer individual). There were plenty of Gannet, Fulmar, Red-throated Diver, Little Gull, Kittiwake, Sandwich and Common Terns, plus a few Guillemot, Snipe, Wigeon and Teal. Plenty of Meadow Pipits flew in off the sea. Annoyingly, I couldn't get on to a Storm-petrel or a Purple Sandpiper that were called out, and there was debate over a small Skua that flew north that some observers noted as an Arctic Skua while Steve Exley was adamant it was a Long-tailed Skua. Whichever it was will have to go done as an sp. Interestingly, Steve mentioned how some birds can be easily misidentified. 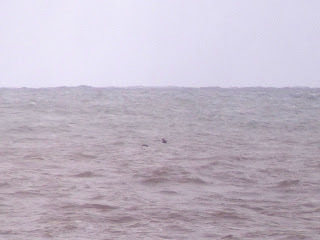 On one occasion recently a Skua flew low and close in and landed on the sea. 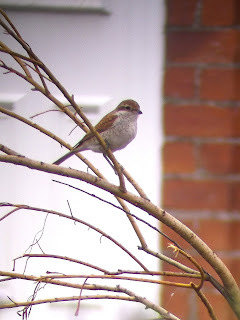 Everyone in the hide was convinced it was a Long-tailed, but only after looking at photographs taken was it discovered that the bird was actually small Arctic. Despite a couple of missed opportunities, it had been an exceptional morning. Later during the afternoon I popped back in time to see four Pale-bellied Brent Geese fly north – the first of the autumn. After the morning seawatch I took a walk around the triangle north of the Obs in the hope of catching up with a few migrants. 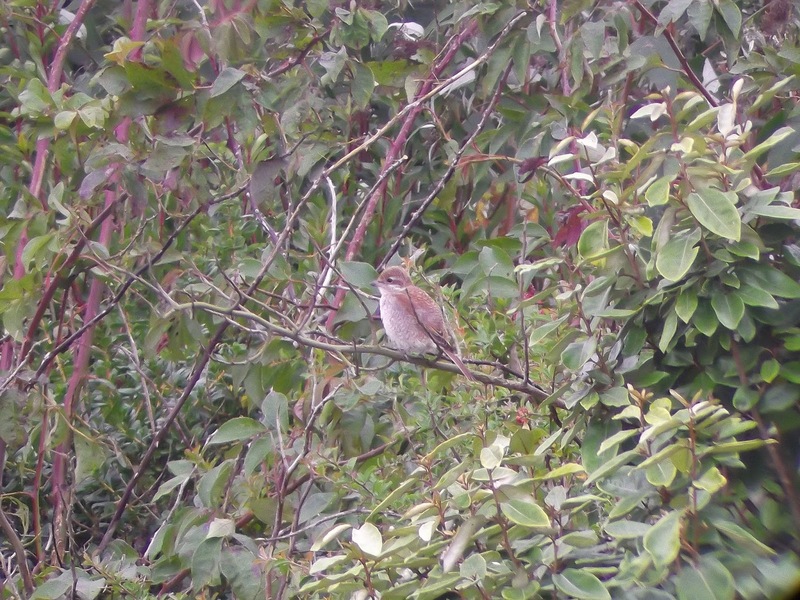 The wind had dropped by now and first up was an almost resident juvenile Red-backed Shrike at Southfield Farm, just up the road from the observatory. This youngster had been present for nearly three weeks and he didn't disappoint, showing very well feeding on bees and other insects and perched close up on occasions. 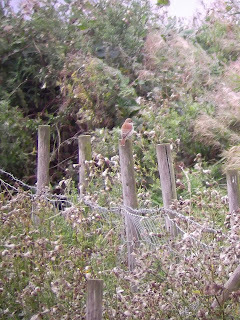 A Kingfisher, apparently rare for the area, also showed briefly from the farm pond. 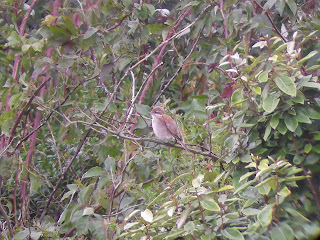 The rest of the walk didn't produce any unusual birds but four Whinchat in Clubley's Field were nice to see. 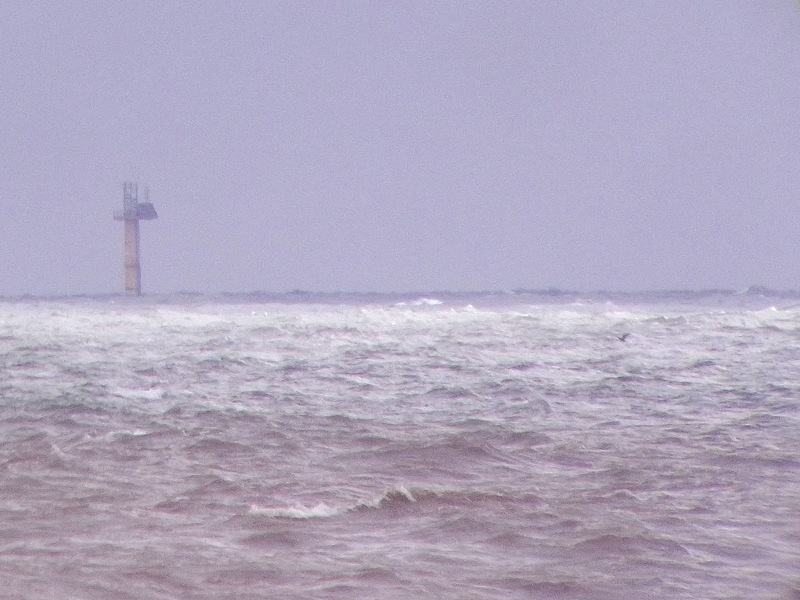 After lunch I joined Sean, Matt and Steve for a walk down towards Spurn Point. The road was closed due to some storm damage and it was relatively quiet on the bird front. 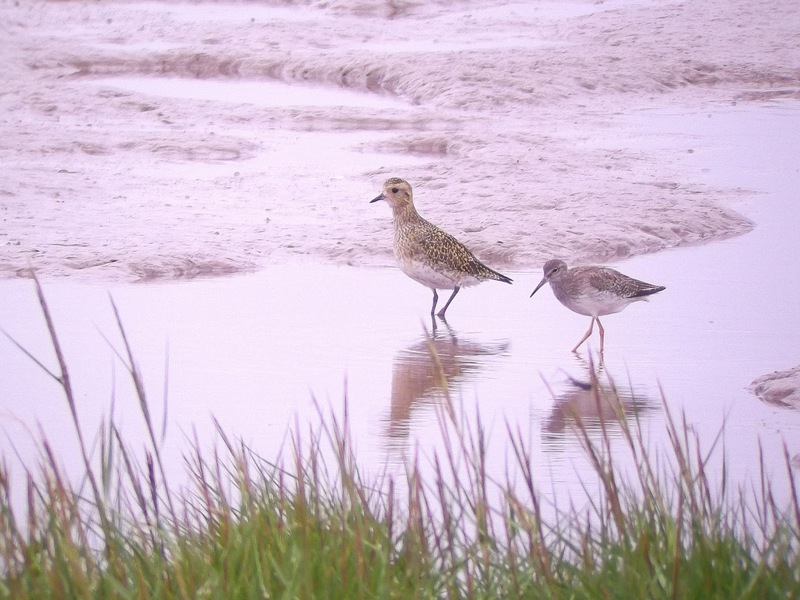 There were plenty of waders on the mudflats, Golden Plover were plentiful along the edges, along with Redshank, plus the odd Knot, Greenshank, a couple of Whimbrel and a small flock of five Bar-tailed Godwit. An odd sighting along the spit was of a Roe Deer near the Chalk Bank hide but the highlights during the walk were three Wheatear and a Tree Pipit grounded on the beach. Day two had flashed by. Only one day left.